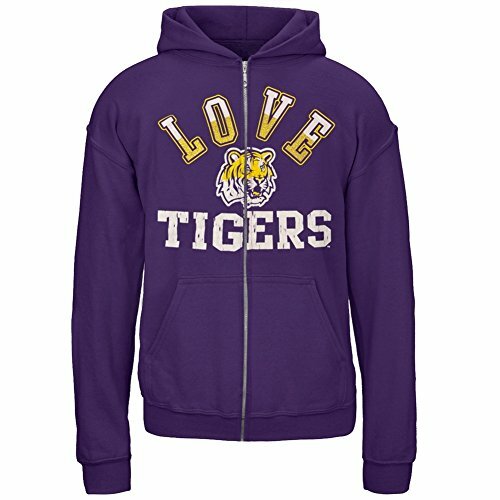 Send your budding Tigers fan out into the world in this warm zip hoodie in a purple 80/20 cotton/polyester fabric. The LSU college team's logo and name are in distressed print across the front, with the word "love" in white and yellow glitter print above. Banded wrists and hem, a super soft lining, as well as side pockets ensure your active sports enthusiast stays toasty and stylish. If you have any questions about this product by LSU Tigers, contact us by completing and submitting the form below. If you are looking for a specif part number, please include it with your message.